David L. Robbins was born in Richmond, Virginia and received his undergraduate and Juris Doctorate degrees from the College of William & Mary. He has been writer-in-residence and visiting professor of creative writing at W&M and taught advanced creative writing for the VCU Honors College. David has published fifteen novels, most recently Low Bird (Thomas & Mercer, 2016), and has had several of his plays produced, including The End of War, which has its world premiere in Richmond in 2017 (tickets on sale now). He is a co-founder of James River Writers, co-founder of The Podium Foundation, and founder of The Mighty Pen Project. Kris: When you finish your last page, what do you do? Do you take a breather from it for a while or do you dive right back into your revisions? David: Neither. By the time the book is finished, it is completely edited. Kris: Wow. I need to hear more about this. David: Here’s what I do. I write during the morning, and when I can sense the book getting ready to be done, when maybe I’m two to three weeks away from the ending, then I start reading the book from the beginning in the evenings. I will typically add five hundred to eight hundred words a day in the morning, and I’ll take nine hundred to twelve hundred words out a night. The book will literally get shorter as I finish writing it. My goal is to arrive at the “end” of my morning writing and my evening editing at the same time. I’ll hit the final word one morning, say good, and then that evening, hopefully, if I’ve done it right, I’ll be able to edit to the end. It’s a race. Kris: That’s fascinating. Honestly, it’s similar to the process I accidentally stumbled into with the novel I’m presently working on. I got about twenty thousand words away from the end, but I needed to see the total story before I felt like I could do justice to the ending. I took a break from the writing for this reading though. It’s amazing to me that you plow through both processes at the same time. David: I refresh myself by doing my editing this way. I go, “Oh, that’s right, she was on that boat that sank,” or “Oh, right, her father was an alcoholic.” That lets me really crescendo the book because I’m relighting all those fires as I get into the last portion of the book. Kris: So no pouring it all onto the page and editing it all later for you then? David: To me, to “get it out of your hands” and “just get it out” is reminiscent of that old joke: my grandmother walks five miles a day; she’s done it for three years, and now we don’t know where she is. It creates manuscripts that are uneditable. Minotaurs so great that writers don’t know what to do with them. I beg aspiring writers to ignore that advice, to be meticulous, to be careful, to study their own work, to interview every character and say, do you need to be in my work? Interview every act. Does it drive the story forward? Interview every setting. Are you sufficiently dynamic to be in this book? If you were to watch me in a five hour writing session, you’d see me typing for fifteen minutes. I sat down to write today at 10:30 a.m., but I didn’t write the first word until 1:00 p.m. I did nothing but think until I could see and plan five chapters out. What is the impact of the scene? How will it come back? What will it say about my characters? Until I invented the next five scenes, I couldn’t write this one. If I was just getting my book out of my hands and writing to edit later, I’d write scene upon scene I wouldn’t be able to use. Kris: When you’re doing your heavy editing, what kind of things are you doing to your work? David: The first thing I look for is conciseness. If I’ve said something in ten words that I feel could be said in four, I cut the six. I go on a seek-and-destroy session to find those words that do not serve. I want my work to be round twelve of an Ali-Frazier fight. They’re exhausted, and all they can do is hit each other close and with everything they have. When you pick up page one, I want you to be exhausted by page two, because it’s intense and dynamic. There’s no waste; there’s no fat. All the punches are to the ribcage, and you feel everything. I don’t put scenes in kitchens, on telephones, or in cars, because they’re not dynamic settings. If someone’s in a car, you know nothing’s going to happen. They’re in a car. They’re going somewhere. And if they’re on the phone, you know nothing’s going to happen because they’re in different freaking countries. I vet everything. It’s manic sometimes, but I vet everything. The early writing is sometimes me working out my thoughts. The second pass, I catch that and kill it. Sometimes, I’ll write an entire paragraph about what someone is thinking or feeling, but the thinking and feeling will almost always be pulled out of my work, because I’m telling the reader how to think and feel rather than having the character’s actions telling the reader how to think and feel. That’s me working things out. When I pull that paragraph out, it’s because it’s already clear without the explanation. 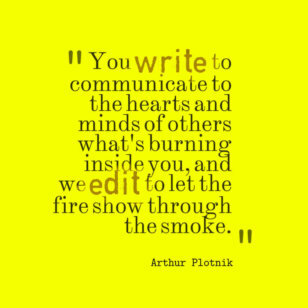 I’ve done my job and didn’t know it in the moment of creation; I do know it in the hours of editing. 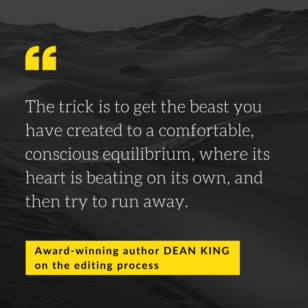 Kris: And how is this process different when you’re editing a play? 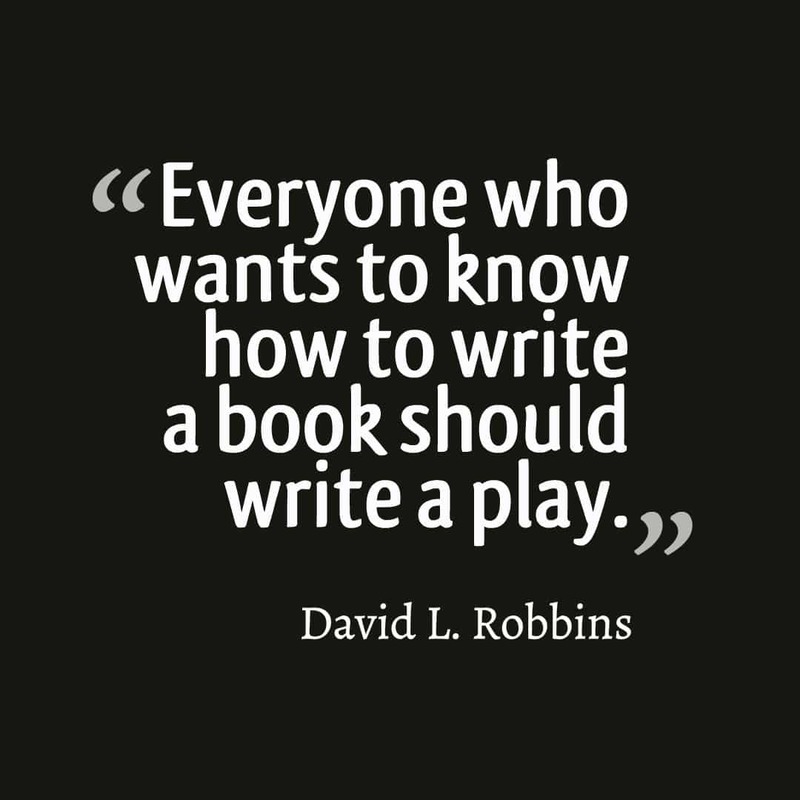 David: Everyone who wants to know how to write a book should write a play. If you are a young author and you want to know how to write a book, stop and write a play first. In a play, you don’t have 400 pages. You have an audience’s attention for two hours, and that includes an intermission. You can’t have a dull kitchen, or a car, or a phone call. It doesn’t work. You have to have kinetics. Characters that represent opposite viewpoints. Every scene in a play has to be a boxing ring. One comes from that corner, one comes from the other corner, they meet in the middle. Try not writing tags, the “he said” or “she said.” This discipline forces you to concoct language that’s self-identifying. “Put down that gun” is clearly said by the guy who doesn’t have the gun. “Hello, how are you?” Who’s saying that? A stage play takes away everything from the author but action and dialogue, which means characters have to do and say what’s in their hearts, their intentions. Writing for the stage, your audience isn’t privileged with what someone is thinking. When a writer is struggling with a scene in a novel, I say, put down the book you’re working on, and imagine you’re writing it for the stage. Strip away everything but what they say and what they do. Kris: There are so many great pieces of advice here, but what is your biggest note for aspiring writers about revision? David: Aspiring writers suffer from a lack of confidence in their story. If you feel like you’re in front of your story, pulling it, don’t write it. You must sense that you’re behind your tale, chasing it, trying to corral it. 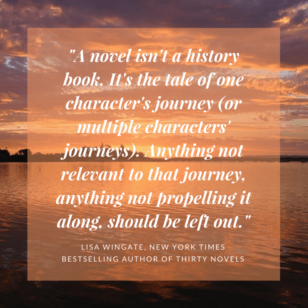 You must feel like that scene and that story, and the hearts of these characters, their lives, their tragedies, their perils, goals, gifts, chasms are so mighty, that you question your ability to capture it. You should never have to invent. You always want to choose. You want to feel like every skill and talent you have is dedicated to containing the story, not hauling it over your shoulder. Kris: Not even dashes? You’re tougher than me. Kris: One of the big ones on my list is nodding. There’s so much nodding in early drafts! David: Yes, nodding. They cannot lock eyes across the room. They can’t use the word “now.” In a story, it’s always “now.” Get that out of there. Kris: This interview is like a mini-master class in editing subtleties. I love it. 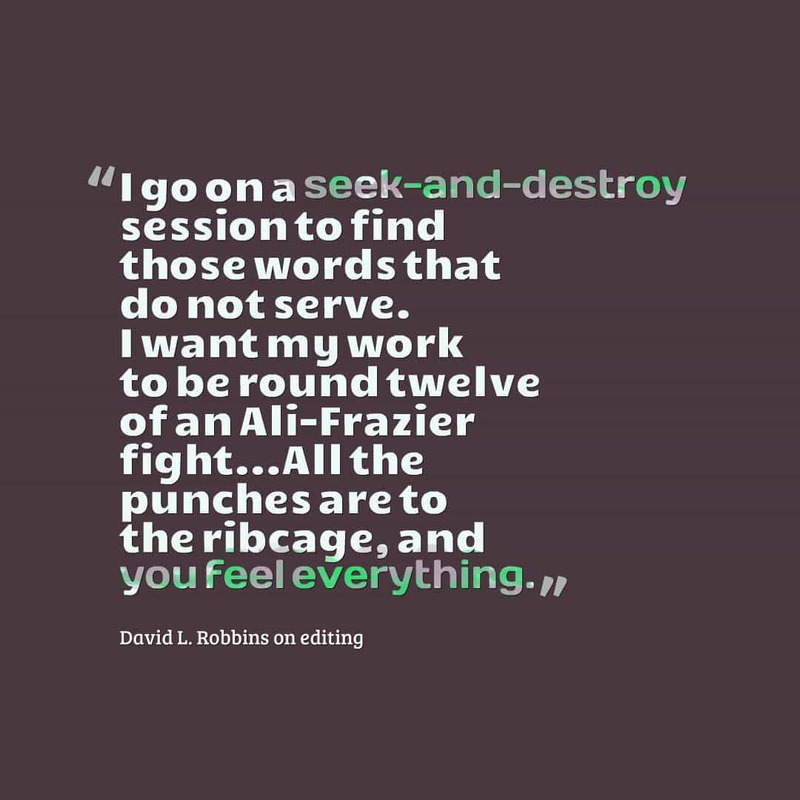 Thank you again, David L. Robbins, for sharing your writing and editing wisdom, and happy writing, everyone!